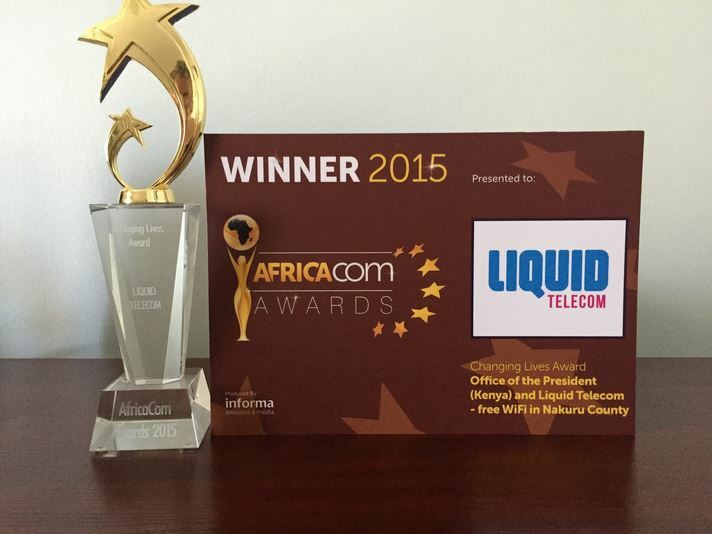 At this year’s AfricaCom awards in Cape Town, Liquid Telecom, in a joint effort with the Kenyan Office of the President, won the top award in the Changing Lives category for providing free wireless internet (WiFi) to homes and businesses in Kenya’s Nakuru County; a county with a 307K population enjoying the internet Bilawaya. What this award recognizes is an inspiring initiative that has impacted online communications and business doing in and around the Nakuru community and contributed significantly to economic and social development of those living in the area. The Changing Lives category was highly contested with up to 10 companies shortlisted as finalists including Ericsson, Orange & WIOCC. The Nakuru WiFI project is the first of its kind in Kenya, and sees Nakuru bypass Nairobi to join Kigali in Rwanda and Tshwane in South Africa as the first major urban centers in Africa to enjoy access to free public WiFi courtesy of a direct county government effort. The WiFi initiative dubbed ‘Bilawaya’ was launched in April 2015 and it covers a 10-kilometre radius from nakuru’s Central Business District offering a 1 Gbps capacity available on major Nakuru streets, market areas, transport termini and stadia within the 10 kilometer radius. Also covereed within this radius is are a couple of university campuses where it is most needed. The Bilawaya initiative has continued to provide people with WiFi-enabled devices free access to the Internet to do their business while managing to block devices that want to stream content off the web or download copyrighted material such as movies and music from illegal file-sharing websites. As a result of the successful partnership with GoK to launch Nakuru’s Bilawaya initiative, Liquid Telecom has already been approached by 5 other County Governments to implement a similar solution in their own spaces. Further, Nakuru County has already been asked to extend the network to other areas within the County to meet the ever-growing demand for data consumption with plans already underway to connect Naivasha and Gilgil towns as well as Egerton University in Njoro and more streets and public areas in Nakuru town.